Midway Volunteer Fire Company deploys 13 pieces of apparatus from two stations. They consist of 3 engines, 1 ladder truck, 1 rescue truck, 1 tanker truck, 1 field truck, 1 fire police traffic unit, 1 utility truck and 4 command vehicles. Both Engine 5 and Engine 15 are exactly the same in all respects. This was done in order to make training, operation and maintenance easier. Both trucks were ordered at the same time and were put into service in early 2008. This truck was designated as Engine 15 until the new Pierce Quantum arrived. When that truck went into service early in 2008, the 1996 Dash then became Engine 15-1. 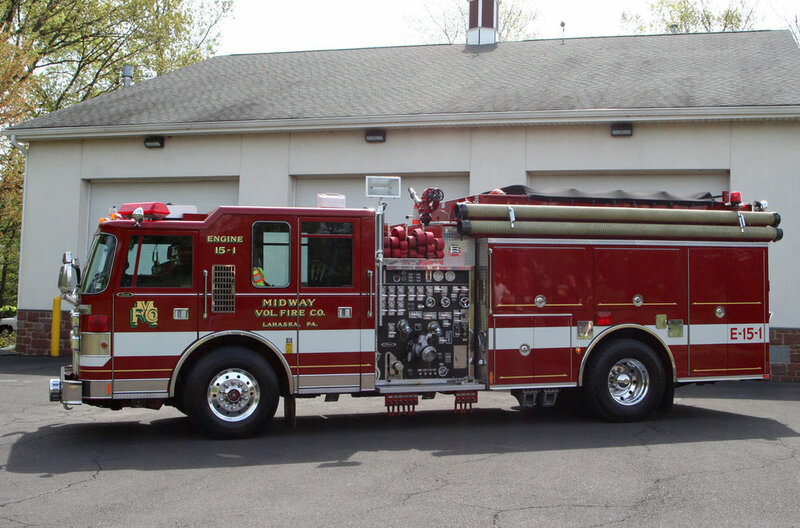 A decision was made in early 2009 to convert the newly designated 15-1 into a rescue pumper. In September of 2009 Homatro installed the new rescue tools and compartment modifications on Engine 15-1 in the rear compartment where the booster reel was located. Body built by 4 Guys, Inc.
All rights reserved. Copyright 2019 Midway Volunteer Fire Company. Use or reuse of any or all content without express written consent from the Chief or President of Midway Volunteer Fire Company is strictly prohibited. Site owner Midway Volunteer Fire Company. Site host SquareSpace. Site design by M.Louis Photography.